Happy New Year to all of our wonderful Concrete Paving Friends! It’s shaping up to be a great year already as 2019 marks the 30th Anniversary for the OK/AR Chapter ACPA. Our chapter has accomplished a great many things over the past three decades and we look for even better things ahead! Involvement in the Portland Cement Quality Initiative Task Force (PCQITF) has been a phenomenal mechanism for adoption of new and innovative materials and techniques over the past several years and has produced many advancements in our industry. Additionally, we are very excited about our new partnership with the University of Arkansas in collaborating on concrete pavement research initiatives. Our annual concrete pavement conferences in Arkansas and Oklahoma have been showcases for this new technology and great sources for networking within our industry. Please do not hesitate to contact any of our staff to help you with your future concrete paving needs. Brody Branson receiving Scholarship check from OK/AR ACPA Chairman, Dale Baker. Also pictured, Todd Steelman of Allen Contracting. 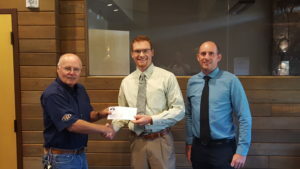 Sam Macklin receiving Scholarship check from OK/AR ACPA Chairman, Dale Baker. Also pictured, Russell Kent of MacArthur Associated Consultants. 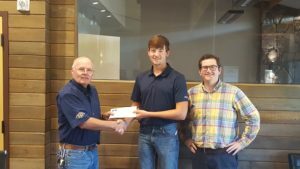 OK/AR Chapter, ACPA handed out scholarships to two local students in August as they prepared to return to fall classes. Students pursuing a degree in civil engineering or construction management and who work as an intern for an OK/AR Chapter member company are eligible for this scholarship. Sam Macklin spent his summer as an intern for MacArthur Associated Consultants. He is a senior at the Oklahoma State University and plans to graduate in the Spring with a BS in Civil Engineering. Sam has worked in several different aspects of design while at MacArthur and has spent time working with ACPA’s WinPas pavement design software. Brody Branson is a Construction Management student at Oklahoma State University who spent the summer working as an intern for Allen Contracting. Brody was able to gain broad concrete paving experience including spending time working on the construction of a variety of concrete pavement projects. He will be returning to OSU this Fall as a Sophomore. Congratulations to both our 2017 Scholarship winners!